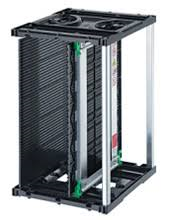 【NIX】Super nikko-Rack | Products （Peripheral Components ）| MASS CO., LTD. Highest efficiency,highest performance,and highest quality magazine in the industry. Plastic base. 30% stronger than conventional models. Lead-free process compatible. Cardguide construction and plastic that withstands PCBs after reflow (135°C/165°C). Faster assembly. Simplified unit shipping and assembly enables 70% faster turnaround compared to conventional models. * All standard models are shipped partially assembled. Complete assembly is optional.